Description: Used on many Black Forest cuckoo clocks. Hand carved walnut stained wood. A set consists of a rifle facing left and a rifle facing right. Warehouse find. Regularly $12.00/set. While supplies last. Description: Used on many Black Forest cuckoo clocks. Hand carved walnut stained wood. A set consists of a rifle facing left and a rifle facing right. Warehouse find. Regularly $14.00/set. While supplies last. Description: Used on many Black Forest cuckoo clocks. Hand carved walnut stained wood. A set consists of a rifle facing left and a rifle facing right. Warehouse find. Regularly $16.00/set. While supplies last. Description: Plastic dark amber deer eyes sold in pairs. 6mm Diameter. 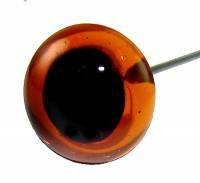 Description: Plastic dark amber deer eyes sold in pairs. 10mm Diameter. Description: Plastic dark amber deer eyes sold in pairs. 2mm Diameter. Description: Hand carved in the German Black Forest. 3" overall height. Description: Plastic dark amber deer eyes sold in pairs. 3mm Diameter. Description: r ivory paper dial has roman numerals. No trademark (plain). Description: Plastic dark amber deer eyes sold in pairs. 5mm Diameter. Description: Plastic dark amber deer eyes sold in pairs. 8mm Diameter. Description: Plastic dark amber deer eyes sold in pairs. 9mm Diameter. 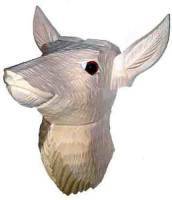 Description: Unfinished hand carved wood cuckoo clock deer head with colored eyes.measures 4-1/2" tall. Made in Germany.